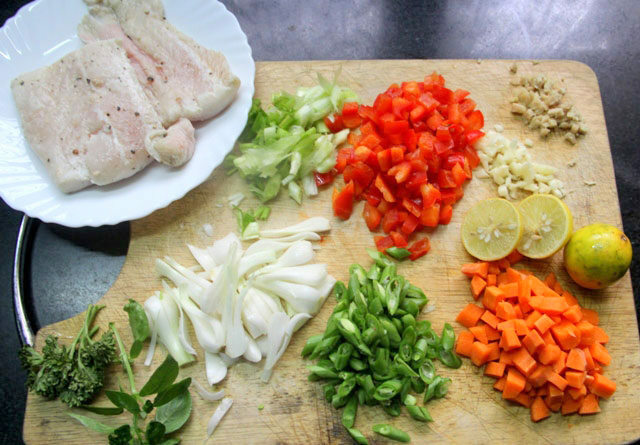 The fast, fresh and simple cooking continues in my kitchen and in my compulsion to mix, stir, fry and try I stumble upon some flavours that simply blow me off. Yeah, I am not even ruing to be modish, rather quite intentionally flamboyant for a change. 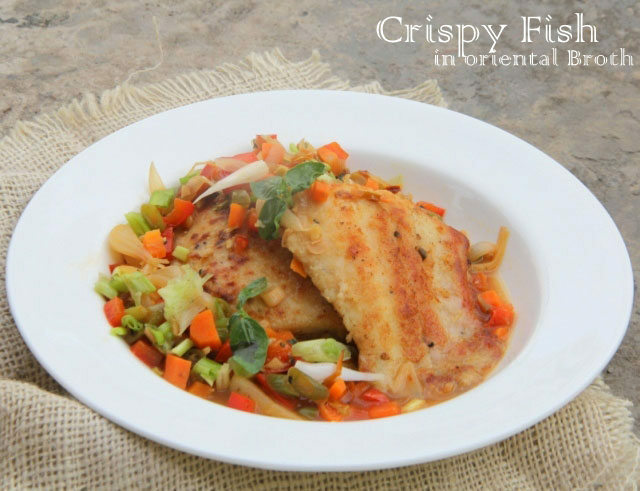 If you too share a palate for simple, aromatic, tangy yet hot Oriental flavours, you’d not help but affirm to my brag after you try this Crispy fish in oriental broth. 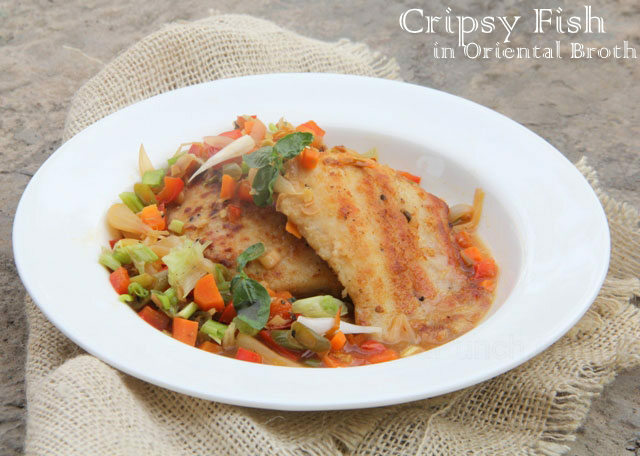 Besides being a sheer treat for the eyes that you can clearly see through the pictures, the recipe is a great find for summers. It is absolutely light, slightly lemony, flavored with fresh herbs, just the way a summer recipe needs to be. 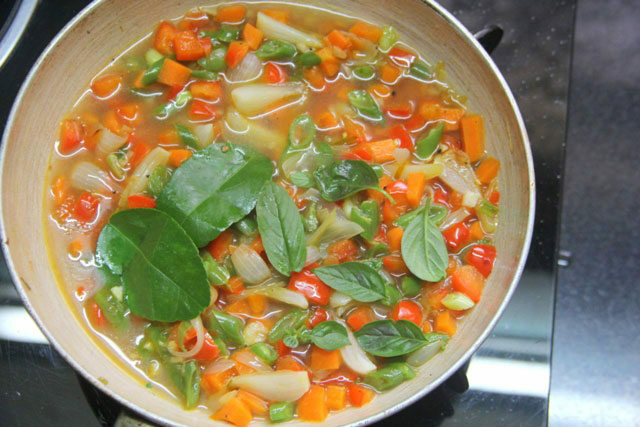 The excess of veggies and the goodness fish, a light yet fragrant broth makes it quite a healthy dish too. It is such relieving recipe for a summer afternoon that I’ve been living on it for last two days straight. 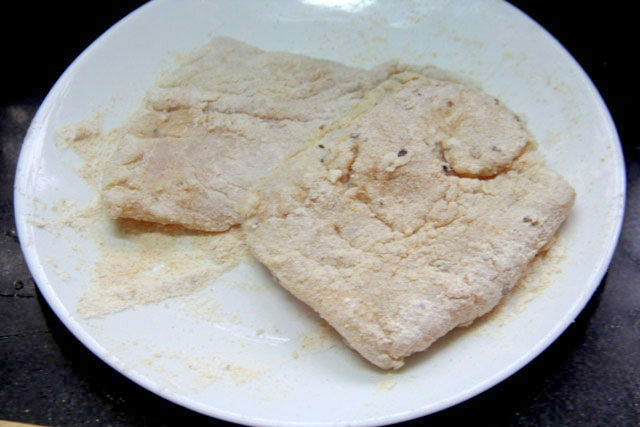 Start by dressing the fillets with vinegar, a little salt and pepper and keep aside. 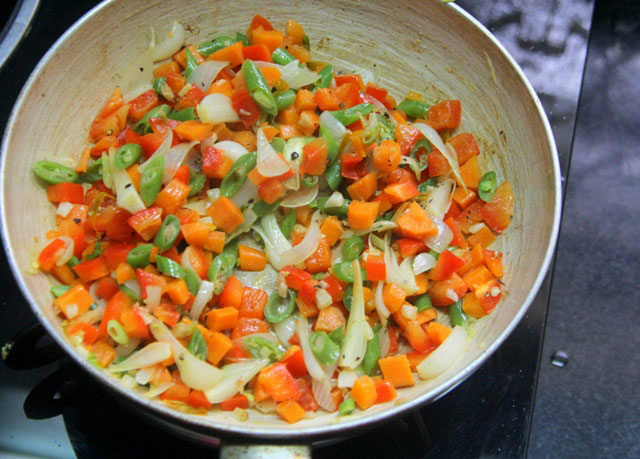 Now heat a sauce pan or frying pan and add 1 tbsp of olive oil an d1 tbsp butter, add chopped ginger, garlic and chillies and fry for a few seconds, you need not brown them just let it sizzle away. 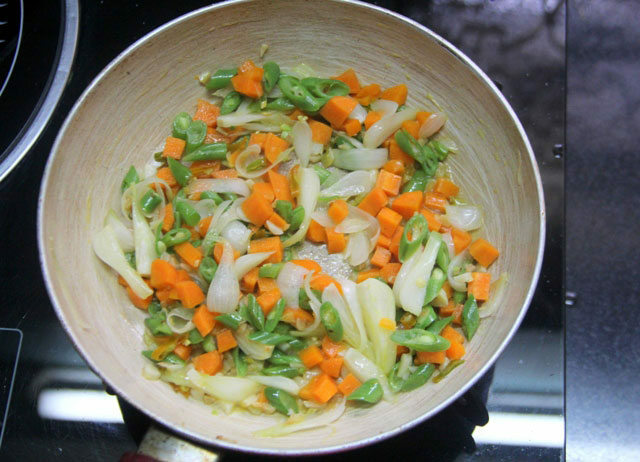 Then add the sliced spring onion bulbs, carrots and beans and stir fry on a low heat until slightly softened, about 3 mins. Add the chopped peppers, dress with salt and pepper and fry for a minute on high heat until all liquid (if any) dries up. The add a cup of stock or water, squeeze lemon juice, tuck in one half of the squeezed lemon shell too and discard it later for a lemony flavor. Also add the lime leaf, some basil leaves and simmer for a minute. Finally add the fish sauce and increase the flame, allow the broth to bubble away and reach a decent consistency, say it should be reduced to just half. Turn off the heat, discard the lemon and lime leaf, sprinkle chopped coriander, chilli flakes, adjust salt and set it aside. 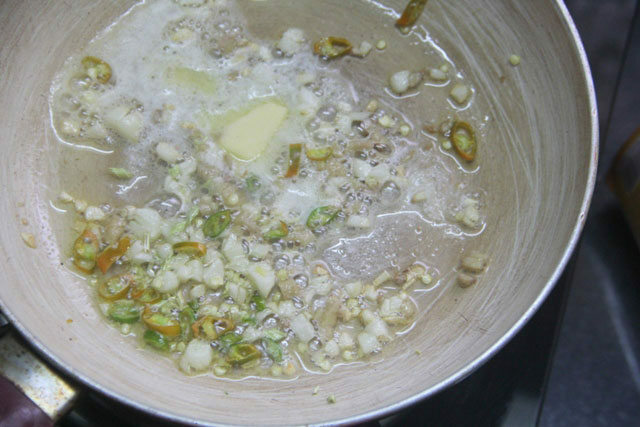 In a separate frying pan heat the remaining olive oil. 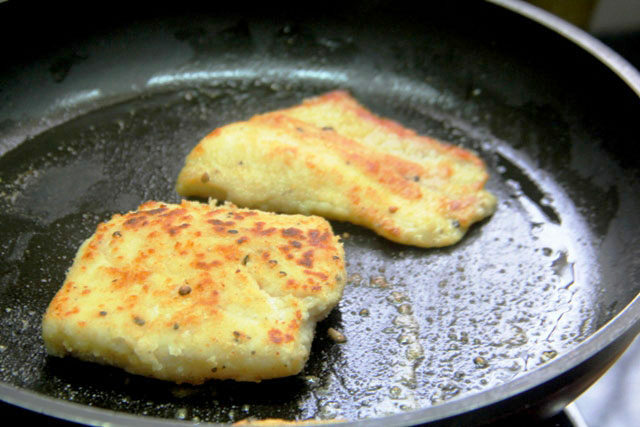 Drip the excess liquid off fillets dust it with the flour and then pan roast until crisp and golden on both the sides. It should take about 2-3 minutes on each side. 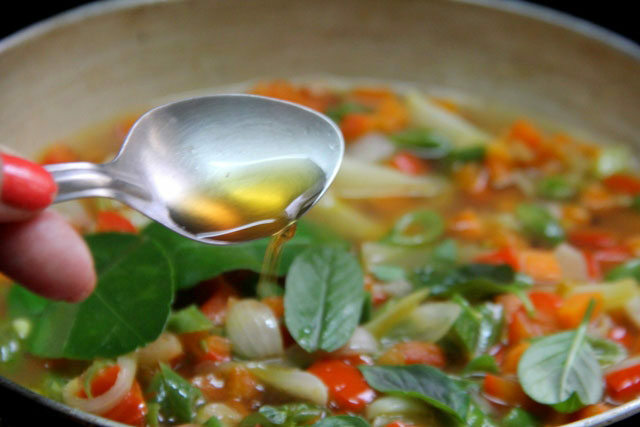 To serve, place the fillets in a deep dish and pour a good amount of the broth with veggies, garnish with some more basil sprigs and serve warm. Maybe keep some bread to dip in if you like but its quite wholesome on its own I feel. Do not overcook the fish, thats the first rule. 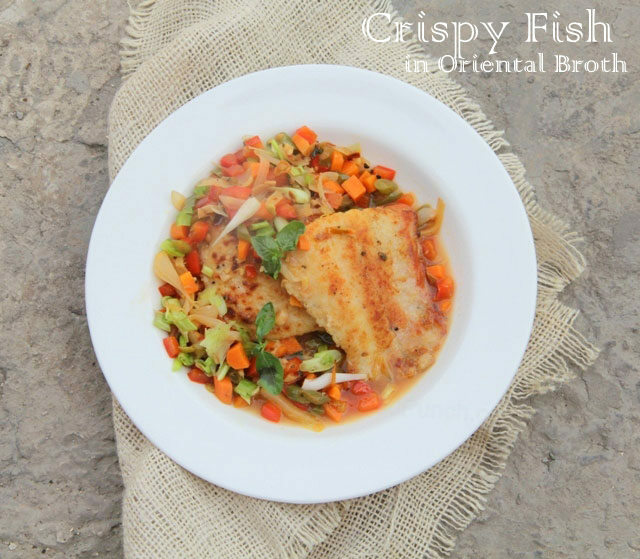 The broth can be made in advance and kept in the fridge, just re-heat and serve with freshly seared fish.